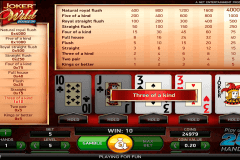 Joker Poker by Betsoft is a video poker game with a multi-hand gameplay and a wild card implemented into the deck. 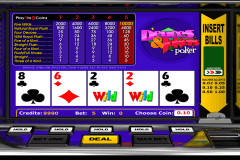 It is very basic and follows the regular concept of video poker games with Jokers, yet there is no single hand playing option. Let’s take a deeper look to make a constructive exploration. 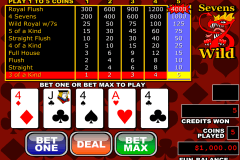 Basically, this free video poker game is played with a 53-card deck, which is a standard one plus the Joker. The Joker is a wild card, which substitutes for any other card in the deck to build up more winning hands. The betting range here varies between 1 to 5 for each hand played. The number of played hands can be 5, 10, 25, 50, and 100. It is not possible to play one hand, unfortunately. The minimal winning hand to qualify is Kind or Better, which is okay considering the wild card in the deck. It is not that random and wild, as the Deuces Wild one, so the RTP is more stable too. The RNG, However, is average or lower. You can’t get any significant benefit unless you have a very strong hand and you are lucky to win the bonus round, which is the only way you can extract benefit. About the gambling round. You won’t believe it, but yeah, it is the doubling up round. Just kidding. It is so sad that almost each online video poker has this feature. Anyways, you are offered to double up or lose by guessing a card, which should have a higher value than the dealer’s one. You will win two attempts in the best case. 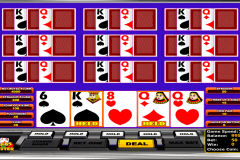 To conclude, this casino game has nothing new to introduce and offer, but it is still an okay example of what online video poker can be. Utterly easy to play and the only skill requirement is to know the combos and hold cards. No download is needed to try.